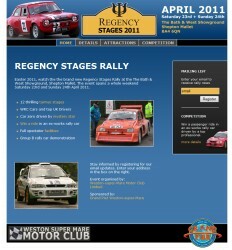 The Weston Super Mare Motor Club (WSMMC) is organising a brand new rally event in 2011. To help promote the event, they wanted this website created to compliment a print-flier given out at a local enthusiasts day, as well as over the year before the event itself. The timescales and budget were exceptionally tight, but the site was still delivered on time and to the required cost. If you’re interested in rallying, why not get yourself along to the event either as a spectator, or even as a driver! Want to get close to the action? There’s a competition on the site to win a ride in a rally car driven by a top professional! What are you waiting for?